Posted in Art, Books, Creativity, Huxley, Imagination, Language, Psychedelics, Terence McKenna (mp3) and tagged Art, Books, Creativity, Huxley, Imagination, Language, Psychedelics, Terence McKenna. Thank you so much Lorenzo! I have fun listen your podcast. Anyway, this is a good collection of books. 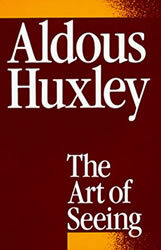 But I only read Aldous Huxley book. I download its eBook on my iPod few months ago. Good to know Huxley story as a child debilitating his illness. That he use bates method to save his failing eyesight. I think the idea of this book is to improve your vision. I think I have to use this method to for my vision to get some benefits. Okay just till there and I will take a tour on your site. Looking for the next target to listen. Ha-ha! Lorenzo, one thing to note about Rube Goldberg is that he isn’t necessarily being remembered in a negative light when the term “Rube Goldberg Device” is invoked to indicate that something is extraneously serpentine or overly complicated . In fact, Goldberg was lampooning these types of inventions/ideas and so technically he isn’t being disparaged when someone critiques something as being like a Rube Goldberg Device. It’s an honor! “It’s very hard for us to understand this because we accept this medium [television] so thoroughly into our lives. But in fact it is shaping our value systems in ways that are very hard to suspect or even detect. I mean Television, for example, is a drug. It has a series of measurable and physiological parameters that are as intrinsically its signature as the parameters of heroin are its signature. I mean, you sit somebody down in front of a TV set and and turn it on. Twenty minutes later come back, sample their blood pressure, their eye movement rate, blood is pooling in their rear end, their breathing takes on a certain quality. They are thoroughly zoned on a drug. And when you think about the fact that the average American watches 6 1/2 hours of tv a day… Imagine if a drug had been introduced in 1948 that we all spent six and one-half hours per day, on average, watching. And the one thing about drugs, in their defense, is that it’s very hard to diddle the message. A drug is a mirror, but television isn’t a mirror. Television is a billboard, and anybody who pays their money can put their message into the trip. This is an extraordinarily insidious situation. This kind of statement is wildly prescient & wise in my opinion. If you’re interested reading DFW tackling the subjects of media saturation & struggling to be an authentic human (those two topics are forever linked in Wallace’s mind) I suggest the following non-fiction essays: E Unibus Pluram: Television and U.S. Fiction, Host, A Supposedly Fun Thing I’ll Never Do Again, The View From Mrs.Thompson’s, Present Tense, and his commencement speech to Kenyon College. 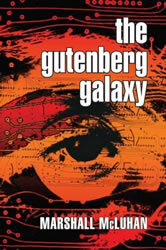 His fiction, especially Infinite Jest, of course unpacks this subject as well. In fact, I’m continually surprised that Infinite Jest isn’t more popular in psychedelic-culture circles. All of our regular topics of discussion appear on page after page. Thanks for your insights, I love McKenna and admire McLuhan but I cannot penetrate Wallace, but you inspire me to try again. I have got to find out what is the big deal with this guy. 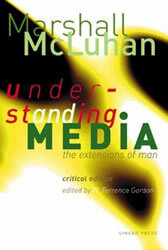 Towards the end of the podcast McKenna says that we need to invent a new McLuhan for the end of the century. In fact, a new McLuhan did manifest himslef – in the form of the French philosopher Jean Baudrillard. His message was informed by McLuhan but in much the way that Marx was a reinterpretation of Hegal. And like McLuhan his message, complicated as it was, is largley maligned and misunderstood – especially in Anglo-speaking countries. But well worth a read and definitely psychedelic in the way that McKenna claims that Joyce is psychedelic. And on Joyce, Part 1 of the podcast was so seductive that I’ve already gone to Amazon and purchased a copy of Finnigan’s Wake and the Campbell key. Lets hope I have more success than when in my early 20s I tried to take on Joyce’s Ulyssess – where I failed miserably in that literary agonistic contest! Thanks for the podcasts. I have no real interest in psychedelics (well not for 30 odd years!). But I do love the podcasts. so then is a podcast a hot medium or a cold one? 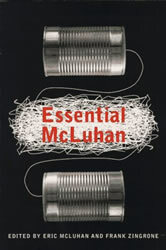 i think BEFORE we need a new McLuhan, we need more of us to have heard the original.